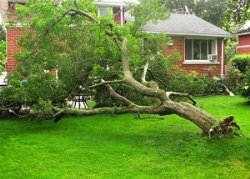 If your tree is severely damaged or diseased, you may want to consider	removing the tree before further destruction occurs. Our certified arborists	at Gateway Tree Care can dispose of unwanted trees to reduce the amount	of waste and damage to your property. We proudly remove hazardous trees	in a timely manner using the necessary equipment. Our technicians can assess the condition of your trees to determine whether	or not it is necessary to eradicate them. If the damage is beyond treatments	or services, we can discuss which options are available to you. Our company	serves West County, South County, Oakville, Fenton, St. Charles, and other	surrounding areas. To request a free estimate for our services,	contact us at (636) 600-1396 today!